Union ministers Arun Jaitley, Ravi Shankar Prasad, Dharmendra Pradhan and Thawar Chand Gehlot were among the prominent candidates who filed their nomination papers for the March 23 Rajya Sabha polls in various states. 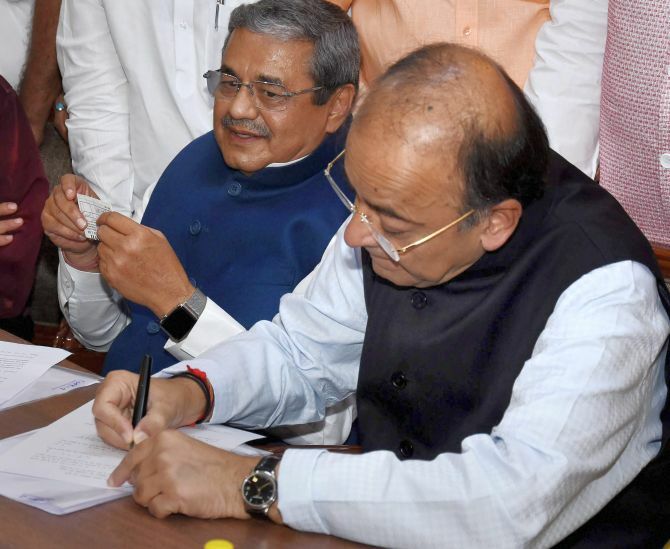 Finance Minister Jaitley, a sitting member of the Upper House from Gujarat, was among the 11 Bharatiya Janata Party nominees who filed their papers from Uttar Pradesh. Union ministers Purushottam Rupala and Mansukh Mandavia of BJP filed their nominations from Gujarat. 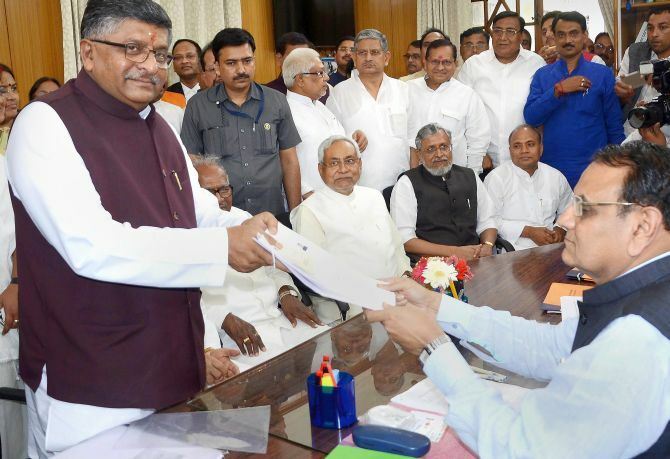 Law Minister Ravi Shankar Prasad, joined the fray once again from his home state Bihar, while Pradhan, minister for petroleum and natural gas, filed his papers from Madhya Pradesh. Pradhan is a sitting Rajya Sabha member from Bihar. Social Justice and Empowerment Minister Thawar Chand Gehlot threw his hat into the ring from Madhya Pradesh. Senior lawyer and Congress spokesman Abhishek Manu Singvi filed his nomination from West Bengal with the support of the state's ruling TMC. Biennial elections are being held for 58 Rajya Sabha seats across several states and by-poll for one in Kerala. The by-poll in Kerala was necessitated following the resignation of Janata Dal-United’s M P Veerendra Kumar, who had quit to after party president and Bihar Chief Minister Nitish Kumar returned to the National Democratic Alliance’s fold. Veerendra Kumar’s term would have expired in April 2022. IMAGE: Ravi Shankar Prasad filing his nomination paper for Rajya Sabha elections in the presence of Bihar Chief Minister Nitish Kumar and deputy CM Sushil Kumar Modi at Bihar assembly in Patna. Veerendra Kumar on Monday filed his nomination as an independent candidate backed by the ruling Communist Party of India-Marxist-led Left Democratic Front. A contest looks certain in Uttar Pradesh with 14 candidates filing their nominations for the 10 seats. A candidate requires 37 first preference votes for a straight win and the ruling BJP can easily win eight. Altogether 11 BJP contestants are in the fray and some of them may be asked to withdraw, party sources said. Monday was the last day for filing nominations, which can be withdrawn by March 15. The infighting in the Gujarat unit of the Congress came to fore on Monday with party leader P K Valera entering the fray as an independent. Altogether seven candidates are in the fray from the state where polling will be held for four seats. In the 182-member Gujarat assembly, the ruling BJP has 99 MLAs and the opposition Congress 77. Both the parties are in a position to send two candidates each to the Rajya Sabha. A candidate can score a straight win with 38 votes. 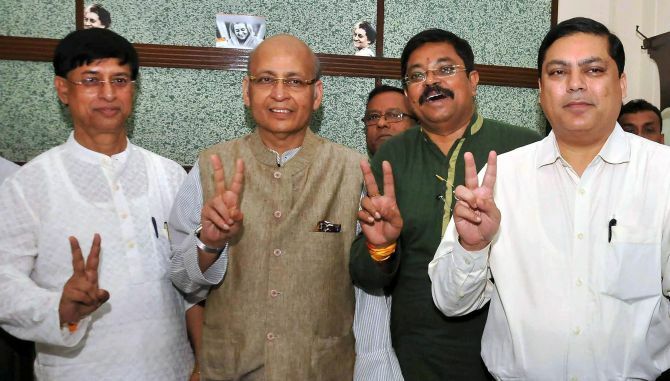 IMAGE: Congress leader Abhishek Manu Singhvi filed his nominations for the Rajya Sabha seat. While Mandavia and Rupala are official BJP nominees, the Congress has fielded Amiben Yagnik and tribal leader Naran Rathwa. Later, BJP’s Kiritsinh Rana, a former MLA, entered the race as the third candidate. However, the entry of Valera, a former IAS officer and current general secretary of the Gujarat Congress, has made the elections interesting. According to Deputy Chief Minister Nitin Patel, Rana has been fielded as the party sees an opportunity for the victory of a third candidate due to the infighting in the Congress. Former Maharashtra chief minister Narayan Rane and senior journalist Kumar Ketkar were among the four candidates who filed their nominations in Mumbai on Monday. Union Human Resources Development Minister Prakash Javadekar had filed his papers earlier. The elections for the six seats were expected to be unopposed but the BJP also fielded Maharashtra State Commission for Women chairperson Vijaya Rahatkar, taking the number of candidates in fray to seven. 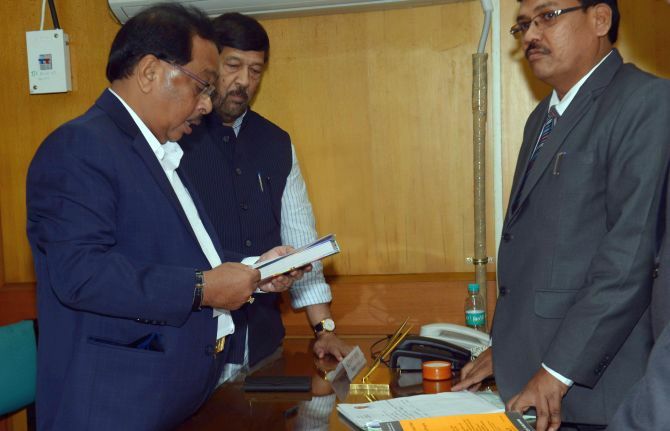 IMAGE: Former Maharashtra chief minister Narayan Rane filed his papers in Mumbai. Rane, a former Shiv Sena and Congress hand, is contesting the election as a BJP nominee, while Ketkar is in fray on a Congress ticket. The BJP, with its tally of 122 in the assembly, is poised to get three Rajya Sabha seats, while the Shiv Sena, Congress and the NCP look set to get one each. In Bhopal, senior BJP leaders Thawar Chand Gehlot, Dharmendra Pradhan, Ajay Pratap Singh and Kailash Soni, besides Rajmani Patel of the Congress filed their nominations from Madhya Pradesh. The BJP looks set to win four seats and the Congress one. Tribal leader and MLA Kirori Meena, sitting Rajya Sabha MP Bhupendra Yadav and veteran party leader Madan Lal Saini filed nominations from Rajasthan. Yadav is also a BJP national general secretary. The Congress is not contesting the elections from the state. In Haryana, Lt Gen D P Vats (retired) filed his papers as a BJP candidate and looks set to win hands down. Anil Baluni, the national media head of the BJP and a confidante of party chief Amit Shah, was set to get elected unopposed from Uttarakhand as his was the lone nomination.